...to this in a matter of minutes. Made for a long night. Ingraham Flats, about 1,000 vertical feet above Camp Muir is a spot that many climbers choose as the high camp versus Muir as it allows for an early accent getting ahead of many of the guided groups that come out of the more popular stopping point. The downside, is having to carry gear up and down that extra few miles. Our day put us at the "flats" at 2 pm and we promptly got camp up and began melting snow for water for dinner and the climb the next day. I sometimes believe the definition of mountaineering is the activity squished between tremendous pain and the boredom of melting snow. The day had been ideal from a climbing standpoint right up until we arrived at the flats and once there, the clear eternal blue and unlimited visibility turned to a grey thick shroud of cotton and the air was heavy with moisture that was felt deep in our lungs. Even more disturbing was the inconsistent wind gusts that exceeded 40 mph. It was hard to discern whether this weather was the system that was predicted for the next day or just some of the local weather that a mountain this size can produce itself. This is another downside of being as the flats versus spending the night at Muir where there is better access to information through the resident national park climbing rangers or the guide services. It was in a word, unnerving. After a dinner of broth, bread and a few veggies, the not very restful evening began. 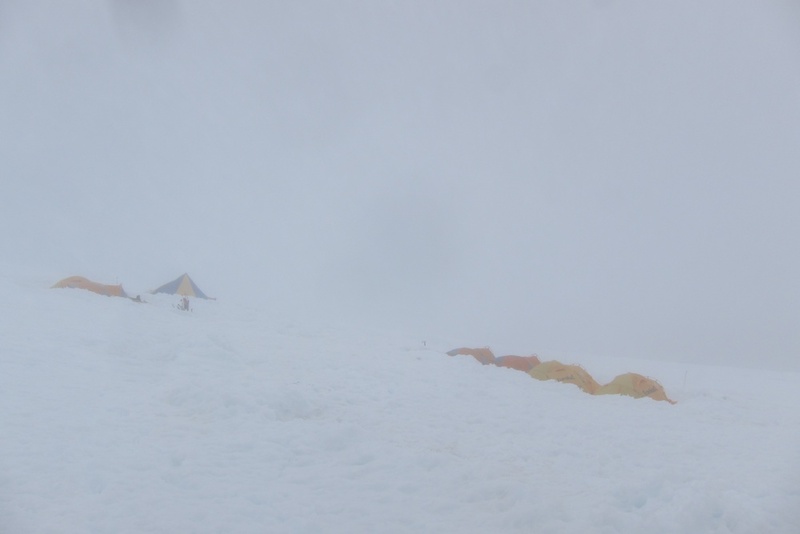 The alarm that was due to wake us up at midnight was not needed as the tents were buffeted all night with sleet, snow and the teeth of a wet wind.